Please obtain the contact of each partner from the section “Partners” of this site. The POLYTUBES Consortium is comprised of the partners from 9 EU countries, which shows the European dimension of the project. The proposed research and development will significantly impact on, not only those participating in the project, but also those who are engaged with the members of the consortium, in various businesses, across all these countries. 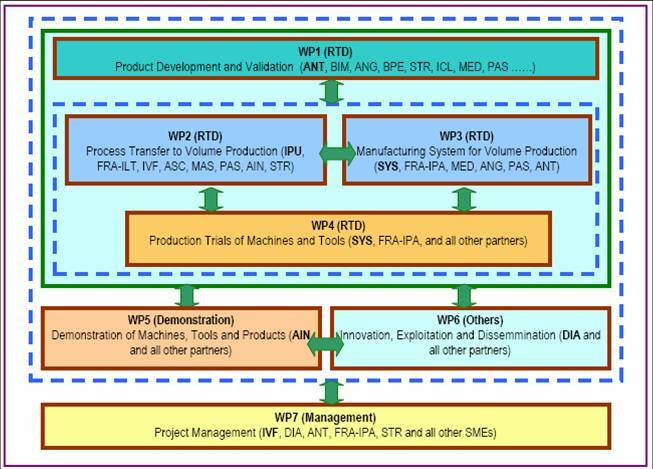 The overall structure of the project is shown in the following diagram. The project contains components of Product Development and Validation, Innovation, Demonstration of machines, Production trials of machines, manufacturing system for volume production which are planned as various activities. The overall objective of the POLYTUBES project is to develop a process chain and corresponding micro-manufacturing platform for the manufacture of polymer-micro-tubes and tubular micro-components for medical and non-medical applications. The proposed development aims to create new markets for EU SMEs with innovative and economically competitive micro-products and micro-manufacturing equipment to meet the needs for a wide range of emerging applications. The development will also support the SMEs to increase business opportunities with new volume production capabilities in micro-manufacturing. The proposed development could place EU in a pole position in the manufacture and innovative applications of micro-tubular products. SO1. To implement a Design for Manufacturing Methodology for design and manufacture of polymer-micro-tubes and tubular micro-components for volume production (from hundreds microns overall sizes to 2-3 microns inner channels), and to validate the methodology and the prototype-products by the end-users. SO2. To transfer laboratory processes and equipment (polymer-micro-tube extrusion, micro-tube-shaping and laser processing) to volume production of tubular micro-components. SO3. To integrate the individual equipments into a process chain and implement it in a manufacturing platform, by adapting a Process Transfer Strategy (Maturity Model), which integrates the business cases into the process chain, together with advanced IT integration and logistics integration. SO4. To demonstrate the technical and commercial viability of the volume production on a full industrial scale by manufacturing prototype products which meet all functional requirements for applications (both medical and non-medical sectors).